On Sunday, thousands of French protestors clad in red scarves gathered in Paris to protest against ‘violence’ and ‘disruption’ which they attribute to the three months of anti-government demonstrations by the Yellow Vest movement. Over the span of eleven consecutive Saturdays, the Yellow Vest movement has paralyzed much of France with street demonstrations and road blockades. Similarly to the Yellow Vest movement, what first began as an online movement has now moved to the streets of France. They call themselves the ‘Red Scarves’. Many of the ‘Red Scarves’ are former ‘Yellow Vests’ who share similar concerns like the rising cost of living. Other than their attire, what separates the Red Scarves from the Yellow Vests is their opposition to the violence or vandalism of any kind, which a minority of individuals within the Yellow Vest movement have indulged in over the past few months. Since the Yellow Vest movement began on November 17th of last year, 11 people have lost their lives while over 2,000 have been injured during violent clashes with police. The creation of the new Red Scarves movement unveils deep divisions within French society that were previously unseen during the last three months of protests. While Yellow Vest protests accuse government forces of using an excessive amount of unwarranted force against them, representatives from the Red Scarves claim that the police have right and obligation to intervene to restore order. The Red Scarves were originally founded by John Christophe Werner. In an interview with the French newspaper Le Dauphiné Libéré, Werner said that he first created the group because “French citizens are being penalized every day by the Yellow Vests’ methods”. “Today, a lot of people are scared to leave their houses, to use the roads, to drive to their jobs,” he added. “We reject violence. We defend the Republic. We promote dialogue,” they proclaim. 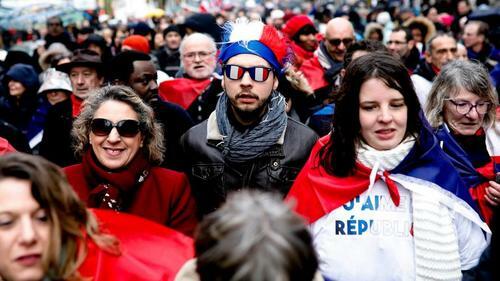 According to various news outlets in France, a split has already occurred among the Red Scarves over whether they should or shouldn’t show support for President Macron. The Red Scarves currently have over 21,000 followers on Facebook.